"Please find enclosed photo of 12 pt. 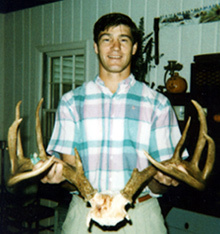 Buck taken 10/8/91 in Conn. during archery season. It is very possibly the #1 typical taken to date. I strongly feel that without the use of my trail master my chances of taking this buck were minimal."